My friend and I did quite a bit of traveling this weekend. I drove and she navigated; we know what we do best. As we traveled to new locations or were forced to detour, I pondered how much our journeys mirror my journey with God. A man’s steps are from the Lord ; how then can man understand his way? On our journey, my friend navigated, and I drove mainly because she doesn’t drive well at night and it was my car. For this trip those were our roles, but this doesn’t mean we couldn’t do the other role just as well. I can read a map, and she can drive a car. For this trip, though, she was the navigator. She told me which roads to take because she held the map. Similarly, in my own life I have to recognize that God is my navigator. He calls the shots because he holds the master plan. The difference is, though, that God and I can’t switch places. He could do both roles, but I’m only suited to drive through his directions. Since my friend was the navigator, I had to listen. At one point, I had an inkling that I didn’t remember taking this part of the road before, but she didn’t tell me to turn. I kept driving. A bit later, she realized that she’d turned off the GPS too soon, so she redirected us. I had to listen. At another point we were stopped by maintenance men and told to find another route because of a huge wreck ahead. Google maps didn’t comprehend what we wanted, so I really had to trust that she knew how to detour us. When I’m driving through life, God gives me one direction at a time. I have to listen and trust that he knows the best route. When I go off course for a bit, I have to trust that he knows how to redirect me. When I hit a road block, I have to listen to his guidance on whether to go through it or how to reroute. I have to listen. As I travel through life, I sometimes want to take control, but I have to remember that the vehicle I’m driving in reality is worth much more and more fragile than a replaceable car. God has only given me one life and one body. My best option in order to avoid a wreck is to listen to my Navigator. Maybe it’s that time of year (school year that is), but lately many of the conversations I have had with people start with a complaint, either from me or them. We’re tired, stressed out, overworked, physically hurting, emotionally spent, and ready for summer break. We don’t mean to be negative, but the fall in Genesis created a world where situations are hard and our bodies grow weary. Our sinful hearts want attention, and, for one reason or another, groaning and complaining garner attention faster than rejoicing. I do not believe there is a problem with sharing our struggles with one another, but I think there are limits and ways to do it in God’s light. Galatians 6:2 reminds us to “carry each other’s burdens,” so we are meant to be open and honest with each other. This chapter goes on to say, though, that we should be careful and test ourselves lest we take pride in ourselves alone. It seems that at times our “sharing” of burdens becomes a form of pride in how hard our individual lives are. Galatians reminds us that while we are carrying each other’s burdens, we are still responsible for carrying our own load. We are meant to bolster each other up when we have burdens of sins and sorrows, but we are still meant to do the heavy lifting of our loads. Sometimes we just complain to hear ourselves complain. God makes it pretty clear that he does not like a grumbling heart. Besides plainly speaking it in the New Testament several times, he also provides an account of how he dealt with the grumbling Israelites in the book of Numbers chapter 11. They complained that they didn’t have good food to eat, so God sent down fire. Then they repented, so God stopped the fire. It wasn’t long, though, before the complaints began again. God gave them meat, but he caused it to burn up and become a plague before they could consume it. That’s righteous anger and strong evidence that God does not tolerate whining and complaining. Before I speak my complaints, I want to test them to ensure that I’m sharing them for the right reasons. Ultimately I want to developing the rejoicing heart that Paul talks about in Philippians 4. When I meet trials, I want to be able to rejoice in the Lord rather than complain in the flesh. This observation of my own conversation as well as the conversation around me also has made me realize just how easy it is to fall into the trap of one-upping one another with our problems rather than listening. Usually what happens when someone shares a burden or just complains for sake of complaining, the listener will share their own similar burden in an effort to relate, but it diminishes the other person’s burden. Just today while walking between classes, another teacher shared that she was suffering from a physical pain; rather than expressing sympathy or pointing her toward the blessings of God, I responded with my own physical pain. How does that kind of response help her at all except make her feel that her pain is less important? I don’t know her motive for sharing this burden with me, but my response should always be one that reflects Christ. My response should be one that is cheerful and encouraging. Proverbs 17:22 says that a joyful heart is good medicine, but a crushed heart dries up the bones. This doesn’t mean I diminish the person’s complaint by smiling and telling a joke. It means that in a loving way, I remind them of the goodness of God. This also means that when my flesh starts complaining to myself and hosting its own little pity party, I find a kind and loving way to remind myself of the goodness of God. I am making two points here I believe. Firstly, we should test our own words before they come out. Before we speak a complaint, we should look into our heart and decide if we are sharing to allow someone to help or sharing because we want attention. If it’s a complaint, we should turn that complaint into a praise to God. Secondly, when someone shares a burden with us, we should respond with Christ’s love rather than one-upping or dismissing their statement. Don’t allow them to continue too long in a pity party, but be sympathetic and loving. 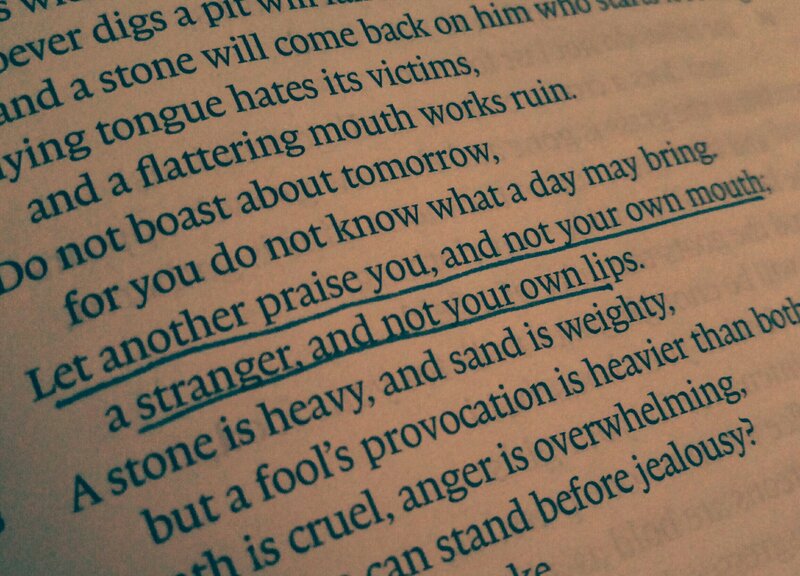 I read this verse yesterday and decided I would strive to be more cheerful and kind today. I imagined myself as a little joy-giver to everyone I met. Then BAM, all of the little annoyances started. It was cold outside. The kids were talkative and unfocused. Many of them didn’t have their homework completed, and some even tried to finish while I was teaching the lesson. There are too many low grades, which makes me feel bad. The lesson felt rushed and ineffective. I forgot to do things. Then I agreed to sub during my planning period, which was fine, but I had procrastinated on my last period planning so I felt worried all day there wouldn’t be an opportunity to do it (that worked out). My last period students were whiny and wanted a free day. After school I realized I left my car keys in the room where I subbed, but it was locked so I had to walk home to get my spares. So many things kept trying (and sometimes succeeded) to steal my joy. I must admit that at times I displayed more of a crushed spirit because, you know, misery loves company. Ultimately I let my emotions dictate my actions. In a perfect God-planned way, my class discussed today that God is faithful and ready to forgive our sins when we ask. That promise restores my joy. Tomorrow is a new day to try again, with God’s renewed strength, to be joyful and to be the encouragement God has called me to be. When I was a little girl, I used to take our laminated map on long car trips. I would figure out where we started and where we were going and use a dry erase marker to connect the points. I drew a line. There’s more to this story than entertainment for a young child. Now that I’m a bit older, I also try to draw lines, not between two places on a map, but between me and somewhere I want to be in life. I decide that I want to do something in life and then I draw a metaphorical line to get there. I make plans. Go back to the car. That line I drew on the map did not determine how we wherever we were going. My mom determined that part. Similarly, I can draw metaphorical lines, but God ultimately determines the path I take. Proverbs 16:9 We can make our plans, but the Lord determines our step. A week or so ago I made a post about the phrase “pushing on a pull door.” For me, pushing on a pull door is when I try to make plans that involve more than just me. It also usually means that I am making plans without God. It’s cool how God constantly reveals things to me when I just search for answers. Making plans without God is futile and they often fail. Right now I know that some things might possibly happen in my future or they might not, and my tendency is to plan in my head how I think the situation should turn out. This often in the past has led to disappointment though when something does not turn out according to my plan. These verses tell me that we should make let God make the plans. Our actions should reflect our faith in God. If our actions reflect the fact that God has it all under control and that He has it planned for good, then our plans will succeed. If our plans reflect that we trust God with whatever comes out of a situation, then we will be truly happy.